With the 2017 Toyota Tundra, you can take on the biggest jobs, yet still enjoy excellent comfort every day. An advanced powertrain provides the right kind of muscle, while helping you stop at the pump less often. That combines with a functional bed, practical systems for the cabin and plenty of room for up to five adults. You can get the Toyota Tundra in several configurations, including regular cab, double cab and CrewMax. With four trim levels, called SR, SR5, Limited and Platinum, you can find the right mixture of features to accommodate your lifestyle. 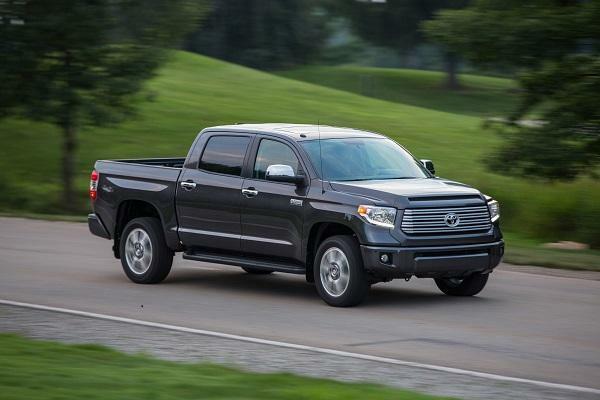 When it comes to power, you can get it for the Toyota Tundra from two robust sources. The first is a 4.6-liter V-8 engine with 32 valves and dual independent variable valve timing (VVT-i) with intelligence. This setup is good for a peak 310 horsepower and 327 lb.-ft. of torque. The second option is a 5.7-liter V-8 with 32 valves and dual independent VVT-i. It pushes out a peak 381 horsepower and 401 lb.-ft. of torque. No matter which engine you choose, it works with a 6-speed automatic transmission with uphill and downhill shift logic for better towing and hauling performance. Rear-wheel drive is standard, while you can add four-wheel drive to any trim. Because you work and play hard, the Toyota Tundra comes with features to accommodate your lifestyle. You can get a 38-gallon gas tank, so you can go further between stops to refuel. Engineers designed the truck to take on big towing and hauling duties, including a TripleTech heavy-duty frame with 12 bolts and a towing hitch receiver integrated into it. With the 5.7-liter V-8 engine, this truck can tow up to 10,500 pounds. When it comes to hauling, the truck can handle up to 2,080 pounds, depending on the configuration. On all models, the rear bumper contains a 4/7-pin connector, so you can plug trailers in with ease. While you're pulling additional weight, the combination meter helps you monitor oil pressure, gas pressure, coolant temperature and the battery closely. Tackle every job, and even running errands around town, with confidence, thanks to the many safety features included on or available for the Toyota Tundra. Some work to make you as a driver more aware of dangers, while others reduce the risk of injuries in a wreck. For example, you can add a blind spot mirror, which constantly monitors for other vehicles in the next lane. Even when drivers can't see the danger, this technology provides a warning. Similarly, rear cross-traffic alert tells you if another car is approaching from the sides as you're reversing out of a spot. You'll find the Toyota Tundra provides plenty of interior space, no matter the type of cab you select. Choosing bucket front seats means you benefit from a large center console with ample covered storage and a 12-volt auxiliary power outlet. Fold-up rear seats accommodate taller items you don't want to put in the bed. Plenty of available amenities make trips short and long more enjoyable. Among the long list of options is dual-zone automatic climate control, leather upholstery, wood trim, seat heaters/ventilation, navigation and more. Now that you know about some of the many benefits the Toyota Tundra provides, schedule an appointment to take one for a test drive.